1. Click on My Account (top right). 3. Download the Template and Read Me files by clicking on the filenames and selecting Save. You are advised to read through the Read Me file before carrying out your import. 4. You can select Tags you would like to associate with the contacts by selecting from your tags list. To select multiple tags, hold down the CTRL key and click on the tags. You will need to separate your import files by tag. For different tabs, start a new import. 5. 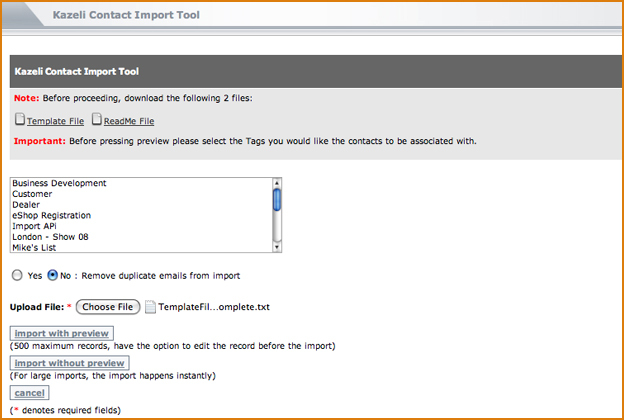 Select Yes or No for the option to automatically remove duplicate email addresses from your import. 6. Prepare the import file and click on Choose File to load the final import file. (See below for more details about preparing the Template spreadsheet). Will organize your file into a clear, editable list which you can modify before the actual import. This option will only work if your file contains 500 or less contacts. For larger imports, this will instantly upload all contacts without generating a preview. 1. Save the template to your computer and open it using Microsoft Excel or OpenOffice Calc. 2. Copy/paste or type in your contact details into the correct columns, keeping to the format provided. 3. Save the file as Tab Delimited Text file by going to Save As, clicking on the Save as typedropdown list and selecting Text (Tab delimited).